This post will be breaking down the vocal effects used on the lead vocal in my mix of the song “Treasure Hunting” by Sarah Emerson (http://www.sarahemersonmusic.com). The artist, Sarah Emerson, and producer Ryan Matthews were kind enough to let me use the song to make some tutorials. I really love this song and the production, and just happen to have used more than a couple of effects to give the lead vocal a sense of space and interest, so I thought it would be a good one to breakdown! I’m going to start by explaining each effect used, section by section within the song – starting with verse 1 – in this post. I thought it would be interesting to get very specific about the effect settings, as well as why I chose them. I’m going to get VERY specific! So, we’re going to start really simply in part 1, where we will be checking out the first verse. So first off, to give the vocal a bit of depth and width i’ve got a UAD EMT 140 plate reverb on the lead vocals for the entire song. The send going to this reverb does have some volume automation (the plate reverb SEND from the vocal track is automated up during the verses, and down in the choruses by approximately 4.3 dB). Also note that this is the ONLY effect that is used throughout the entire song. My goal in using this specific plate reverb on the lead vocal is to provide depth and space. Additionally, by taking out most of the lower frequencies and drastically reducing the low mid range of the reverb, the effect is able to add these characteristics I want without adding too much additional “mud” to the mix. This reverb choice was also based partially on the way I felt the singer should be perceived. A plate generally doesn’t sound like a “real” space to me, its a bit surreal sounding. Especially when eq’ed so that just the mid range and top end left in. Since the song has electronic and dance elements I want the effects to feel surreal instead of “real”. Its not a band playing in a room! EQ – Cutting below 2k, and boosting above 200Hz. Some pretty drastic EQ! 100% WET – since it’s being used on an aux track and not directly inserted on the audio track. Half way through the first verse, I introduce a slap delay on the lead vocal. Initially when I added this slap delay, I tried to add it at the start of the first verse. After hearing it though, I felt the vocal sounded less engaging with it in off the top of the song. I then tried taking the slap delay out entirely until the pre-chorus. Eventually, I settled on having it come in half way through the verse as it does now. It isn’t an incredibly obvious effect, but it definitely adds a bit of extra width to the vocal and puts it “inside” of the music or track a bit more. This happens because using a short delay gives the listener a sense of a closed space (think early reflections from walls in a room). The automation for this slap delay SEND starts a bit lower, and the volume raises gradually to swell into the pre-chorus. The effect sort of “sneaks in” half way through the verse and then remains at a constant volume for the rest of the song more or less. Here’s a screenshot of the slap delay’s send automation. You can see it enters half way through the verse quietly, then ramps over the last few bars…. I am a huge fan of this plug-in! The “style” settings, width section, and modes make it super flexible. I feel you could replicate almost any other kind of delay within this plugin. Delay Time – Using a short delay of 126.2 ms. With slap delays, I usually do NOT time it to the song. With almost any other delay I always tempo sync, but with slaps, I will usually pick a time between 90ms and 130ms, and just move it around until it feels right with the song. Filters– I’m not using the built in filters this time because I’m filtering the delay after with a waves SSL Channel which i’ll explain shortly. “Tweak” button – I love this setting! I’ve set it so the width is 15 degrees, and the L/R offset is 8 ms. This was adjusted by ear. I generally set the L/R offset between 9 o’clock and 12 0’clock, and then adjust width to taste. I held back the width on this effect because I like the song to evolve and grow in many ways, including width. Leaving the verse and pre-chorus delays a little more centred allows the chorus delays to hit with more impact and width. Feedback – None on this one. I wanted to keep it short and clean. Groove and Feel – Zero. I often use these for eighth or quarter note delays, but found it necessary for a short slap with zero feedback. Style-“Studio Tape” -this is the default setting. I’m shaping the sound after with an SSL channel so I didn’t feel the need to experiment with this setting this time, but the various style settings are amazing and i use them often. It’s worth taking the time to cycle through every single one individually. Also note: Try tweaking the saturation setting while listening to different “styles”, as the knobs behaviour changes based on style. 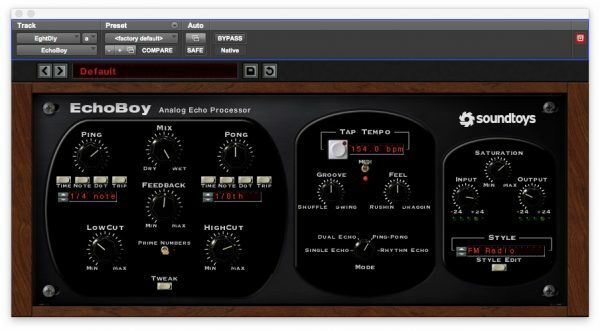 This SSL Channel strip plug-in is inserted after the Echoboy instance for some EQ shaping. Filters– Removing everything below 167Hz and above 10kHz. EQ – HF Shelf boost of 8.7dB at 10k. So i’m setting my LPF at 10kHz, and then boosting a lot right at that same frequency with a shelf EQ. I’m essentially rolling off everything above that on a 12db/octave slope but also boosting it all 8db to create a curve where 10k and above is boosted but still rolls off at 12db/octave. This decision was made by ear and is just relative to how the vocals were sitting in the track. No philosophical reasoning for this one. Near the end of the verse, i’ve highlighted a couple of words by sending them to a delay. Sending the bold words only.. “this is ME, this is YOU, this is us, this is how..” to the buss i’ve labelled “Verse Eight Delay” by automating the send’s mute on and off. I usually try to keep the first verse pretty clean, reserving these types of delays for the pre-chorus or second verse. In this song though, I felt this particular effect and placement adds a weight to those highlighted words which I feel are important to the song, since the singer is addressing the audience directly with “YOU”. Also, the early use of obvious effects sets up the listener for the pre-chorus and chorus nicely, since there are a lot of effects and delays in the chorus on the vocals and instrumental, and this is like a little sneak preview. The channel is also being sent to another reverb which is modelling an AMS RMX16 Hall reverb. Felt it wasn’t achieving the effect I wanted yet. Then thought it still wasn’t cutting through the mix clearly enough. Finally added the compressor at the end to make sure the delayed words would cut through the mix without losing any syllables. So here i’m using the LOFI button. Initially was hoping would be sufficient to make the delay have that filtered sound I was after. Adding bit of feedback. Just enough to give it a few repeats. I’m doing a bit of filtering and mid range boost with the REQ as you can see.. filtering out frequencies below 259Hz and above 10982 Hz, and boosting around 1.6kHz. Just to give it a bit more of that “filtered” mid-range effect i was looking for, which makes it stick out a bit. I’m using the waves R-comp to compress the delayed signal. This brings out the repeats or “feedback” of the delay more without actually having to make it any longer, as well as generally level things out so the delays are very clear and none of the words get buried in the mix. I just used the “vocal” preset on this one. Nothing fancy. Compressing a bit at around 5 or 6 db, and adding some makeup gain as well. Send to another reverb– Last detail- this entire delay chain is being sent to another aux track labelled “Verb 3” which has an instance of Altiverb. I’ll go through this chain in more detail later, but its an impulse response of the famous AMS RMX 16 reverb unit, set to Hall with a decay of 6 seconds. Just to make the whole delay effect have a bit of a surreal ghostly sound, I was trying to make it a little bit haunting. So there’s verse 1. Keeping it simple. How is the effect i’m adding effecting my perception of the vocal? Is this appropriate for the section of the song? how much of the stereo field is this effect using? Does the effect feel natural with the instrumentation? Is it supposed to feel real or surreal? Using these parameters carefully from the start of your mix, until the end of the mix, can really REALLY help to keep the listener interested, and make the song feel fresh as you listen from start to end. i’ll be posting the breakdown of the pre-chorus and chorus effects. Keep an eye out for it! First off it sounds amazing. Second I appreciate the detail you put into this. Keep it coming! Thanks Andrew! Appreciate the feedback! Wow this is an amazeballs blog. Hope you write more braj. Great work, Josh! Love the track and enjoyed reading through the post. Looking forward to reading more. Amazing Mix, great work Josh! 🙂 You defenitely need to to a mix breakdown of the whole song!!! This was awesome! Looking forward to the next one. Hey I got a question. What is the signal chain for the dry vocals? Were there any effects or editing at all for the dry vocal I’m hearing in the first video? I’m obviously very new to mixing and any help is much appreciated. I know it was recorded in a studio (duh), but when I’m hearing the dry vocal before the EMT, what exactly am I hearing beside it being dry, like what compressor is used and how much gain in the preamp! Thanks Josh! P.S. how far away you think the singer was from the mic?